* The price is for one procedure, when buying a package of six procedures. When buying a package of six procedures, loyalty card owners will get an additional 5% discount. We have the greatest experience in laser depilation, and we perform procedures using Alexandrite laser, manufactured by the leading company Syneron Candela and specially developed for hair removal, best affecting the hair pigment melanin and which is the most powerful in hair removal and so we can guarantee treatment of the highest efficiency. Treatments are performed by highly qualified dermatologists specializing in aesthetic dermatology. The latest generation of Syneron Candela Alexandrite laser GentleLase Pro used in Era Esthetic laser dermatology clinic ensures the most effective laser hair removal and is considered the gold standard for laser epilation. This laser allows application of the most advanced treatment algorithms wide-spread all over the world. Laser hair removal means destruction of the hair follicle by means of light. Only light of high intensity and certain wave length can destroy a hair for a long time. Laser hair removal is the most effective method of hair removal. Only high-power light at a certain wavelength can remove hair permanently. Like cars, lasers are extremely different from one another and can be very specialized. They can vary in terms of their purpose, wavelength, power, settings and efficiency! The Alexandrite laser is designed specifically for hair removal; the 755 nm waves it releases are best absorbed by the melanin in the hair. Diode laser waves are better absorbed by oxyhaemoglobin, and there are also fractional lasers designed to rejuvenate the skin etc. Syneron Candela’s Alexandrite laser GentleLase Pro is the most powerful of all existing hair removal lasers and has the highest efficiency in laser depilation. Its released 755 nm wave is absorbed by melanin pigment present in the hair better than by other lasers, while its power is from a few to several tens of times stronger than the one of other lasers. This laser is best suited for people who have I-III skin type (the skin type that all Lithuanian people have, if they do not have a suntan), and is powerful enough to remove even the lightest and weakest hair. What is the difference between laser hair removal and photoepilation? Laser hair removal is the most effective method of photoepilation. Lasers emit monochromic (single wavelength) light of the highest intensity and act on the principle of selective photothermolysis, i.e. purposefully annihilate both the hair follicle and the adjacent cells that form the hair bud. This ensures long-lasting hair removal. Owing to its ability to emit rays of a single wavelength, lasers can resolve specific problems in a specialized manner. Intense pulsed light (IPL) machines emit polychromic (several wavelengths) light; therefore, they cannot act on the principle of selective photothermolysis. The efficiency of hair removal procedures with the application of intense pulsed light depends on the power of the machine. The power of cosmetology machines ranges within 10-15-20 J/cm2, which is not sufficient for destroying a hair follicle. This is why hair grows again within a short period of time even after 7-10 procedures. IPL machines are not designed specially for hair removal and have a broader intended application. 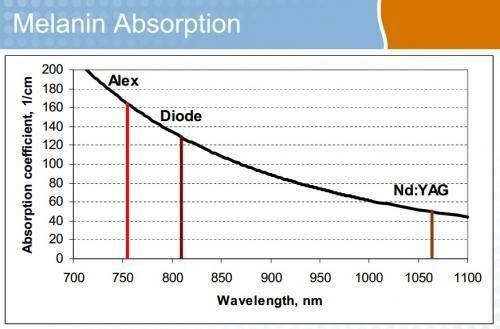 How does the Alexandrite laser act? Era Esthetic laser dermatology clinic is the first one in Lithuania where a highly powerful new-generation GentleLASE PRO Alexandrite laser is used. Its power reaches 17.666 W compared to 1,6-2,9 W in case of other lasers. It is the most effective hair removal laser1 for light-skinned people because its 755 nm wavelength corresponds to the highest peak of absorption of melanin, a hair pigment. Owing to its high power, the alexandrite laser gains power of up to 150 J/cm2, which makes possible even the removal of light thin hair. This laser is FDA (USA Food and Drug Administration) approved for a long term hair removal. When a laser ray passes a hair follicle, the power of the ray burns it immediately. A laser pulse lasts only a fraction of a second. 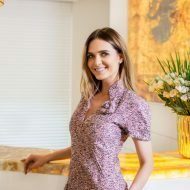 The duration of pulses is calibrated thoroughly in order to ensure that the laser energy is absorbed by the hair follicle and does not affect the surrounding tissues. The integrated skin cooling system DCD ensures safe and painless skin treatment with high-energy pulses while protecting the skin surface against damage. We were the first ones in Lithuania to acquire the especially powerful GentleLase Pro and Gentle Max Alexandrite lasers directly from leading company Syneron Candela. Syneron Candela. Having been working with this equipment for nine years now, we have the most extensive experience in Lithuania, so we can ensure that the procedures are of the highest quality and efficiency. The lasers are constantly renewed and the newest versions are used. Which skin conditions are treated with the Alexandrite laser? Shaving, hair pulling, and depilation creams remove hair just temporarily. Besides, those procedures cause skin problems resulting in hair growing into the skin and causing rash. Even when rash disappears, dark stains remain on the skin for a long time, and in case rash is complicated with a bacterial infection, scars may remain on the skin. The skin becomes rough, and pseudofolliculitis and allergic reactions develop. This problem is acute for both women and men. For the latter, rash after shaving it the most frequent cause for seeking laser hair removal. After the hair follicle is destroyed, hair will never grow again. Stains and rash disappear, and the appearance of the skin improves notably as early as after 1-2 procedures. The skin becomes healthy and smooth again. Which areas can be treated by laser? The most frequently performed procedures for women include hair removal in the areas of the upper lip, chin, legs, arms, underarms, bikini and legs. For men those are the areas of shoulders, back, chest and abdomen. Nevertheless, the Era Esthetic Laser dermatology clinic has facilities for hair removal in any part of the body. Each laser pulse will bring you a feeling of mild tingling and warmth. The newly developed integrated cooling system ensures additional skin protection during the procedures. It cools the upper skin layers just before the laser pulse is emitted. Owing to this feature of the laser system, no contact cooling or cooling gels are required. According to recent research data, the hypothesis stating that hair absorbs the ray only during the growth stage, has not been proved. It becomes evident that at the early anagen (growth) hair contains the biggest amount of the pigment; therefore, repeat procedures must be performed in order to “catch” as many hairs at this stage as possible. On an average, 3-6 procedures are performed. Frequently, the desired result is achieved as soon as after 3 procedures. Hair falls after the 1st procedure, their amount decreases for a long time, and those hair that still grow become thinner, less visible and causing a less severe skin problem. However, a course of procedures should be performed in order to ensure long-lasting results. Procedures are performed every 4-6 weeks. How long does a laser hair removal procedure last? 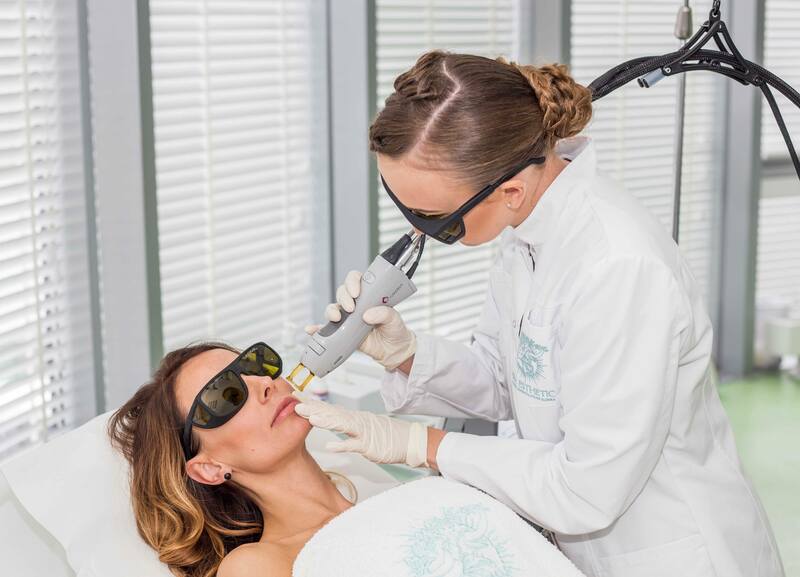 The state-of-the-art laser technologies used in the Era Esthetic laser dermatology clinic allows the use of laser spot sizes of various diameters (ranging from the smallest to the biggest). Therefore, nowadays laser photoepilation is a course of very quickly-performed procedures. A procedure in the upper lip area lasts a few seconds, that in the underarm area – 3 minutes, in the areas of legs and back – 20 to 30 minutes, and in the abdomen area – 10 minutes for men and one minute for women. What should you know before performing the procedures? Avoid active sunshine at least 2 weeks before the procedures, or use sun-screen creams with SPF values higher than 25–30; do not use any self-tanning creams. Do not use plucking or waxing 1 month before the procedure. All other hair removal methods when the hair root is preserved, e.g. shaving and cutting, are permissible. Do not apply to the skin any irritating compounds such as glycolic acid or retinoids 1 week before the procedures. The procedures have the highest effect in case of light skin and darker hair. In case of darker skin, skin-bleaching products can be prescribed 4-6 weeks before the procedure. In case of perioral viral herpes, antiviral therapy will be prescribed if the procedure is to be performed in the facial area. The procedure will not be performed if you are pregnant. Nursing mothers are allowed to undergo the procedure.